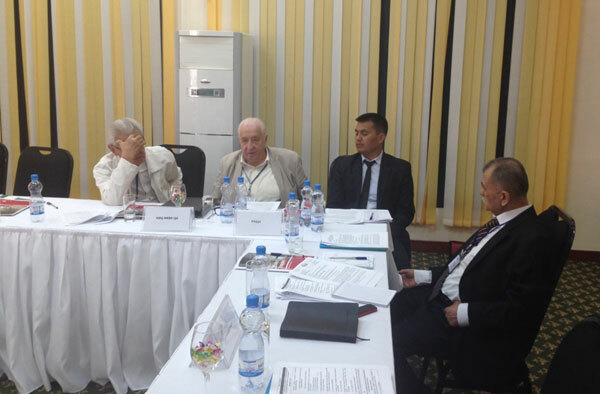 On September 5, 2017, the first meeting of the Working Group on Building Capacity of Regional and National Organizations was held in Tashkent. The event was financed by the CAREC project “Promoting dialogue for conflict prevention related to environment, water nexus issues in Central Asia: Central Asia Water-Nexus Cooperation” (CAWECOOP) supported by EU. Discussing organizational matters of WG activity. The meeting of WG was organized in two parts. The first part of the meeting was combined with the session “Building capacity and water sector professional development in the Central Asian countries” of the 5th meeting of the regional organizations involved in sustainable development and water management in Central Asia. In addition to the group members from Uzbekistan (Mr. Ishpulatov Z.) and Kazakhstan (Mr. N.K. Kipshakbaev), Mrs. Musabaeva K. (National Water Partnership of the Kyrgyz Republic) and Prof. Pulatov Ya.E. (National Water Partnership of Tajikistan) presented their reports. Mr. N.K.Kipshakbev highlighted the issues of regional water cooperation (RWC) in general and in historical context and the role of water sector professional development in RWC, as well as of international projects. Particularly, he underlined that the tasks and aims of international projects contradict each other and do not respond to the interests of beneficiaries. As to national context, he focused on the role of basin councils at the basin inspections in terms of making decisions related to water resource management within the territory of inspections. Mrs. K.Musabaeva reported on water education in the Kyrgyz Republic. This process is considered as an integral part of the nationwide system of training, retraining, and professional development. She underlined the contribution of donors to the development of the system, as well as of international projects in capacity building. Mr.Ya.E.Pulatov presented information on water education in Tajikistan, its role in the Water Sector Development Strategy in Tajikistan and other documents. Mr.Z.Ishpulatov reported on capacity building under the Ministry of Agriculture and Water Resources of the Republic of Uzbekistan. Particularly, he underlined that the system of water sector professional development which existed until 1990s has been preserved, developed and improved on the basis of education legislation. The representatives of regional organizations made presentations on capacity building under ICWC umbrella (Mr.Rysbekov Yu.Kh., SIC ICWC), the results of the project “Building capacity in the water sector in the Central Asian countries” implemented by CAREC and SIC ICWC (Mrs. Ziganshina D.R., SIC ICWC), and on country needs in capacity building identified in CAREC projects (Mrs. Inozemtseva A., CAREC). The participants discussed progress on Activity plan 2017. Prof. Kipshakbaev N.K. proposed the Group to deal not only with professional development. The participants discussed the format and content of national and regional reports that would be presented at the Anniversary Conference of ICWC in Tashkent in November 2017. They also discussed activities to be fulfilled until the end of 2017 and preliminary Activity plan 2018. By September 25, 2017, SIC ICWC (Rysbekov Yu.Kh.) would submit to WG members the structure of national reports and key issues to be included. Based on this structure, WG members would submit the first drafts of national reports to SIC ICWC for consideration by October 20, 2017. By October 15, 2017, SIC ICWC (Rysbekov Yu.Kh.) would submit the structure of the regional report to WG members for their consideration, taking into account proposals submitted during the meeting. SIC ICWC (Rysbekov Yu.Kh.) would prepare the summary regional report on “Building capacity of water experts in Central Asia: achievements and future tasks” by the Anniversary Conference of ICWC in Tashkent in November 2017. Cooperation of SIC ICWC and CAREC on developing the interactive map of training centers dealing with building capacity of water experts in the Central Asian countries should be underlined. The proposal by Kazakhstan to consider in the Work plan 2018 the needs for building capacity of ICWC regional and national organizations in a wider aspect not only through professional development should be taken into account.